A few weeks ago we attended an adoption seminar that ended up fueling our desire to adopt a child into over drive. I remember one of the incredible mothers that spoke who called her adoption process a “paper pregnancy.” Wow. I had never thought of it that way. This adoption process is still very foreign to us, but I am determined to move as quickly as they will let me. When we got the official email yesterday it took me an hour to sign, scan, email back 5 documents and send our first online payment. Think I’m excited? I have already started to ask God to help me with patience because I am prepared (at least I think I am) for the waiting to be the hardest part. Waiting for the paperwork to clear, waiting on the African Embassy to approve us… waiting to finally bring our son home. Anyone have any great ideas?? This three year journey of becoming parents has taught me about faith and my relationship with Christ. No matter how angry I have become at Him at what we have had to endure to make this dream of being parents a reality, He always seems to draw me closer. I am learning that true faith in God comes in the hard times, the times where you want nothing more than to rebel and try it all on your own. Also, by Thursday night we were both in agreement of not starting our 2nd in vitro cycle next week!! Or going further with any more infertility treatments. Sounds crazy I know, but God has put a new journey in our hearts. WE HAVE OFFICIALLY STARTED PAPERWORK TO ADOPT AN ORPHAN SON FROM ETHIOPIA !!! This past weekend we have been letting our family and close friends know the great news and everyone is excited! Granted we have been asked hundreds of questions with the biggest one being…why Africa? I promise….I am committed to keeping every part of this exciting adventure of becoming parents via a “paper pregnancy” every step of the way on my blog :). Hopefully my posts will convey why we feel so strongly about our decision to adopt Internationally. Even with the mounds of paperwork, the long waiting (we are guessing it will take a year and a half until we actually bring him home) and the MASSIVE cost…we are elated! We also know that even though we will be making a better life for one of God’s beautiful children, he will be enriching our life in more ways than we can even imagine :). The thought of our two trips to Africa is also overwhelmingly exciting! The first trip we get to meet him and the second we will be bringing him home :). As always, I thank all my readers for their thoughts, prayers and love! May you all have a wonderful week ahead! This past Tuesday in yet another doctors visit with my mom, I came to the conclusion..,.my mom is officially turning into a woman that I have never known. My strong, active, independent, very social, compassionate mother is slowly disappearing. Two years ago I started to notice changes in my mom. She started to forget things she never would before, she wasn’t socializing with anyone and numbers were starting to really confuse her. I became worried and knew I needed to take action. After MANY visits to her primary doctor and her telling me that there wasn’t anything wrong with my mom month after month (I still have anger towards this woman because I’m pretty dang sure I know if my mom is having problems.). I took action and got referred to a neurologist who could maybe give us more answers. We had MANY visits and tests done ranging from a 4 hour memory/psychological test to an MRI. She was terrified during of all these and looked to her 28 year old daughter for strength. At that time I know I couldn’t give it to her because I really wanted to believe she was ok, so I could selfishly go on living my own life with my husband. Since her father died of Alzheimer’s she would cry to me with grief that she didn’t want the same fate. After everything was said and done they told me she was just fine? Seriously people? Sadly, I accepted the diagnosis, but still fought to keep her on one of her memory medications. I moved her into a retirement community, rented out her house and started paying her bills but didn’t go any further with getting any answers. Fast forward a year…..there have been many indicators in that time that put up a massive red flag; losing her keys at the gas station, not being able to pay her bills or handle money, over dosing on her meds, not knowing what day it is and my new favorite of her calling me 10x/day (no exaggerating). It was so easy to be selfish and put off making new dr appointments for my mom. I just want her to be the woman who I have always known who comforts me as we walk through this infertility journey and my adult life. Sadly, she has no idea what is going on. One day last month she actually called me and asked how the baby was. It felt like a sharp dagger through my stomach. What baby? Tuesday we both got the news we already knew but it was still hard to take. My mom officially has Alzheimers disease. After mass quantitys of paper/verbal tests the new dr came to this conclusion. They actually say you can’t “officially” diagnose until death but he said the tests proved she was well on her way to Stage 2. She looked at me and started crying, my heart broke for her…for us. I can confidently say my mom will never be the same. The hardest part of it all is being unsure that if what I’m doing for her is the right thing. I can officially say that being a caretaker is the hardest job I have ever had. We shall see if that stays true once I become a mom! It only seems fitting that these past few days I have been reflecting on 2011. I am thankful that the promise of this new year makes the hope and anticipation of the future almost unbearable for me 🙂 I am excited for what 2012 will bring! I have been a bit “blog silent” through the Holidays because honestly, I needed time to really work through the loss that we encountered with the failing in vitro cycle. I have read of some clinics around the country that actually offer counseling sessions before, during and after a cycle because it is such an intense process. Physically, spiritually and mentally… it is a tough cookie. It takes my breath away to know that God had a hand on our family scheduling a vacation this past September for New Orleans during Christmastime. The vacation ended up starting three days after we got the sad news. The crazy part about IVF is that you have no say exactly on the dates to start. It took us over two months after the day we decided to take on this adventure to get the end results of a failed pregnancy. There really is something about the charm about the city of New Orleans; plenty of tasty Cajun food, adult beverages, mechanical bulls (oh I sure did!) and the addition of my family that made some of the shock and sadness start to fade. 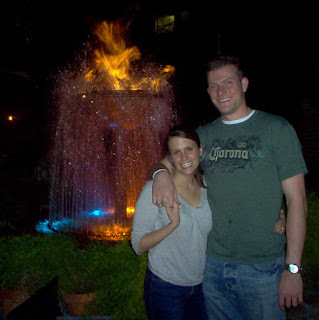 Here is us in 2006 and then in 2011 at Pat O’s. It is amazing how fast 5 years can fly by! Our follow up appointment with our RE about our failed IVF cycle is Tuesday morning. After a lot of praying and time spent talking (we drove to New Orleans for peets sake!) about what happened we have decided to go ahead and do a frozen cycle (FET) with our one remaining embryo. This will be a less intensive process as a “fresh” IVF cycle, but will still take some work with time at the dr and meds. I will post updates as soon as we get some actual information on what may have happened with the failed cycle and what steps we need to take to move forward. Here’s to a glorious New Year for us all!